Scapade is a new, mobile platform that connects travelers and locals based on location and shared interests. It is improving how travelers and locals meet each other and discover experiences. Scapade requested UX guidance as they prepared for the launch of their MVP. I teamed up with two colleagues to provide Scapade with a actionable user research report and design recommendations it could use to improve and iterate their MVP. We started by conducting research to gain an understanding the user needs, business goals, and market landscape. The research would also be used to provide insights be used to provide insights for the Scapade team. We held a kickoff meeting with CEO and founder of Scapade to learn more about the company and its goals. At this meeting we learned that the Scapade app was built around a matching algorithm. Since this algorythm was central to Scapade's experience, our designs would need to incorporate it. Scapade also had some existing branding assets, such as icons and colors, they wanted us to incorporate into our designs. Next, we conducted a competitive and feature analysis to gain an understanding of market landscape. Through the competitive analysis we found that while Scapade does have competition in the travel app space, none focus solely on connecting travelers with locals. This information not only helped us validate Scapade's business model, but also highlighted the areas they should compete. To find the target user, we sent out a screener survey to people across the globe. We were very pleased to receive 334 responses, of which 65 met our target user criteria. Due to time, we were only able to conduct ten interviews. For the remaining target users, we sent out a second, more detailed survey to collect feedback. From the surveys and interviews, we collected some very valuable information about Scapade's target user and their needs. Our final piece of research was an assessment of Scapade's current app experience. We conducted 4 usability tests and found that while people liked the app concept, there were some areas for improvement. Below is a table summarizing the research findings. When reviewing the research findings, we noticed four recurring themes. We used these central themes, along with two personas, to develop a list of possible design features. Since Scapade was looking to for design recommendations for an MVP, we prioritized these features using the MOSCOW method. Below is the list of prioritized features. Each feature ties back to a research finding. This process helps ensure us that our design contains the elements most important to the users. The more information the user knows about a person, the more comfortable they are to meet them. Users value having a shared language with a person they plan to meet. Using this information, we conducted a design studio to brainstorming possible designs. After a few rounds, we collaborated and developed some initial sketches. We used these sketches to create wireframes in Sketch. After developing the initial wireframes in Sketch, we developed a prototype in InVision. We used the InVision prototype to usability test our design. We conducted two rounds of usability testing with a total of 9 users. There was significant improvement in usability from the existing app to our redesign. People were able to complete each quicker with the addition of the bottom navigation. People were also more comfortable connecting with locals when they were able to robust profile included in our redesign. However, users were still experiencing some issues. Many were unsure of the purpose of the app and why they needed to select interests. 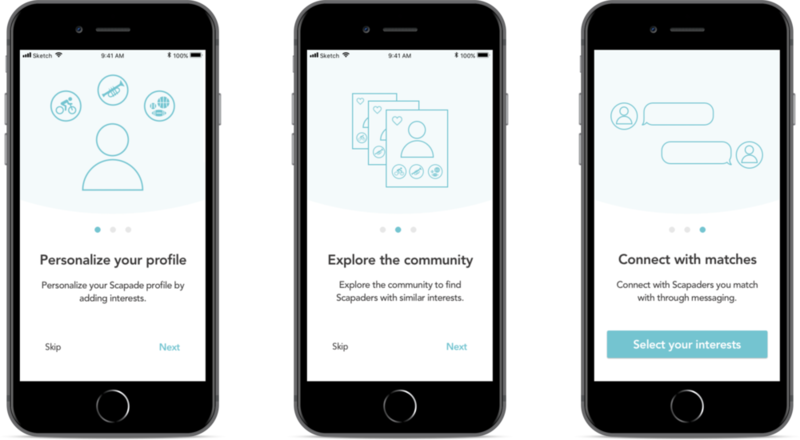 We added onboarding screens to help orient the user and explain the app's purpose. With the addition of these screens, usability improved by 5% in round 2. Overall, this project was a success. We designed an app that fulfilled the user needs and business goals. However, there are some aspects of the project that I would do differently. It can be difficult collaborating on wireframes as a team. Next time, I will suggest using a version control software like Zeplin to making collaboration easier.